THE DAILY PIC (#1424): This is Med-Bar, by Nanu al-Hamad, on view in the design exhibition called “Pavillon de L’esprit nouveau: A 21st Century Show Home”, now running at the Swiss Institute in New York. Med-Barbrings home something we don’t often acknowledge: The radical segregation that’s at work in the look of our culture’s daily objects. 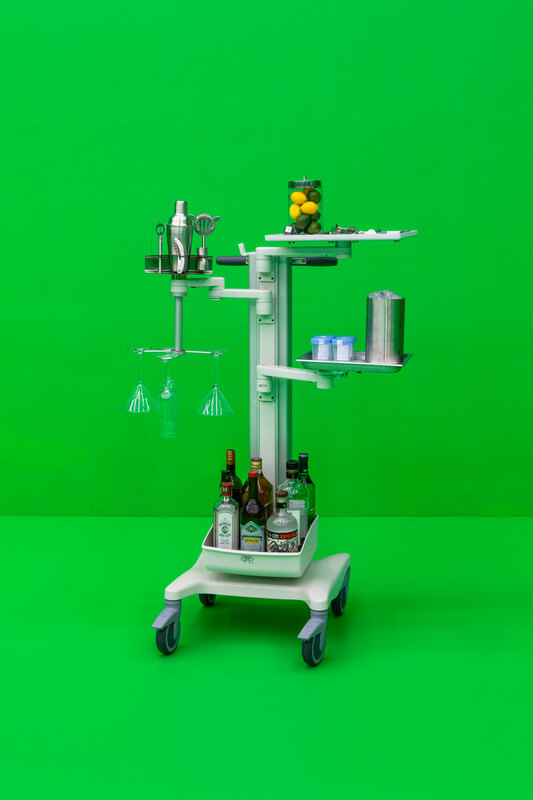 There’s no particular reason that a bar trolley and a hospital stand should require utterly different modes of design, but once you see one doing duty as the other, you realize that they occupy different visual worlds. It reminds me of the way professions used to be radically distinguished by dress, to the point that whole books were once published illustrating, for instance, the difference between a fishmonger’s garb and a butcher’s, a carpenter’s and a shipwright’s. We pretend that such distinctions are necessary, even natural, but the truth is they come from our human reliance on categories.